The Irons lost some of their best players at the end of the previous season. Robert Stevenson had returned to Scotland to play for Arthurlie. Others no longer at the club included Thomas Freeman, Johnny Stewart, Walter Parks, James Lindsay, William Chapman, William Barnes, John Woods, George Sage and William Chamberlain. It was becoming increasingly difficult to persuade men to play for the team. A major problem was the fear of an injury that would result in them being unable to work for the Thames Iron Works Company. The club committee therefore decided to insure the players against loss of wages that might follow an injury sustained during league and cup fixtures. However, the club committee issued the players with a warning that anyone who had been injured in a match had to be home by 8.p.m. every evening. They were obviously concerned that they did not try to ease the pain by spending their time drinking in the local public houses. Henry Hird, a ships plater, who had recently arrived from Stockton on Tees, joined the club. The Hammers also signed several players with experience of playing football at a higher level including Jimmy Reid and Robert Hounsell of Reading). Others who joined included Simon Chisholm (Inverness) and Percy Mills (Gravesend). The Sportsmen reported on 3rd September, 1897: "It is only reasonable to expect an establishment that employs nearly 5000 people to turn out a very good team of footballers. The Thames Ironworks opened their season yesterday at the Memorial Recreation Grounds... During the past few months some very capable players have found employment in the Works and as a result a very creditable exposition of the game was seen." Season tickets for the 1897-98 were fixed at 5 shillings (25p). Tickets for individual matches cost 4d. However, attendances at games were very disappointing. Only 200 people saw the first game against Northfleet. This is not surprising when you compare this with the price of other forms of entertainment. It usually cost only 3d. to visit the musical hall or the cinema. It has to be remembered that at this time skilled tradesmen usually received less than £2 a week. As Dave Russell points out in Football and the English: A Social History of Association Football in England (1997): "in terms of social class, crowds at Football League matches were predominantly drawn from the skilled working and lower-middle classes... Social groups below that level were largely excluded by the admission price." Russell adds "the Football League, quite possibly in a deliberate attempt to limit the access of poorer (and this supposedly "rowdier") supporters, raised the minimum adult male admission price to 6d". Women were initially allowed in free at some grounds as it was believed that it would improve the behaviour of make fans. When Preston North End introduced free tickets in April, 1885, over 2,000 women turned up for the game. Free entry for women was so popular that by the late 1890s all the football clubs had discontinued the scheme. Arnold Hills sent a message to every member of the team: "As an old footballer myself, I would say, get into good condition at the beginning of the season, keep on the ball, play an unselfish game, pay heed to your captain, and whatever the fortunes of the first half of the game, never despair of winning, and never give up doing your very best to the last minute of the match. That is the way to play football, and better still, that is the way to make yourselves men." 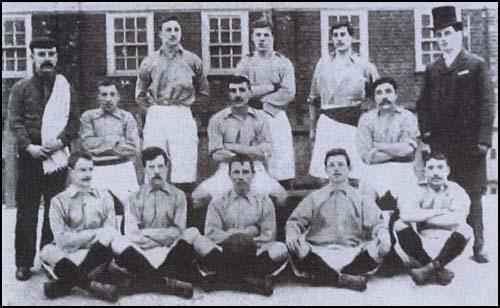 Thames Iron Works also introduced a new kit in the 1897-98 season. One newspaper reporter commented: "A prettier and more distinctive costume than theirs I have never yet seen on a football ground. Light blue shirts, white knickers and scarlet stockings were their colours." However, when the club played a game during a thunder storm in November, 1897, a local newspaper commented that the "Ironworks appeared on the field with brand new white spotless clean knickers and light blue shirts, but before they had been playing long they were like blackamoors". Thames Iron Works beat Redhill 3-0 in the first round of the FA Cup. However, they were finally knocked out by St Albans in front of 1,000 spectators. This was the third successive season that the club had been knocked out of the FA Cup by a Southern League side. Thames Iron Works did much better in the league. They beat Leyton 4-0 at the Memorial Grounds on 2nd October, 1897, with Jimmy Reid getting two of the goals. A crowd of over 3,000 turned up to see the rematch at Leyton's ground later that month. Henry Hird and Robert Hounsell gave the Irons a two goal lead. However, in the second-half, Leyton was awarded a dubious penalty which they converted. Hird, who was still disputing the decision after the goal had been scored, was sent off by the referee. This caused some crowd trouble but the 10 man Hammers held out and even added a third goal, scored by George Gresham, before the end of the game. The match created a great deal of comment in the West Ham Guardian. The reporter at the game blamed the Hammers for the trouble. "Why will the Thames Ironworks resort to such shady tactics to ensure victory when every member of the team can play good sound football if he likes? Arthur Russell was so badly used by the Ironworkers... that he has since been confined to his bed under the doctor's orders... 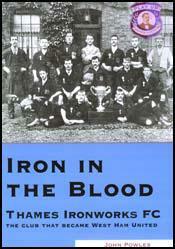 This roughness should be checked by the Ironwork's committee if they have any regard for the club's good name." These comments angered supporters of the club and one wrote to the newspaper putting forward a completely different interpretation of the game: "Now as a common or garden onlooker, I emphatically deny that the roughness was all on one side. In the opening stages of the game one of the Leyton halves adopted very shady methods, and this in the main was responsible for the greater portion of the objectionable tactics. Then, too, the ordering off of the outside left (Henry Hird) was sufficient to drive the team to desperation." Football in the 1890s was a much more physical game than it is today. Players were allowed to "charge" an opponent. A charge was defined as a player who used his shoulder against an opponent's upper body. The main objective of this tactic was to "knock an opponent off the ball". Players were also allowed to obstruct an opponent if they were running into a space to receive the ball from a colleague. However, players were often cautioned or sent off if they criticized a decision made by the referee. There were plenty of examples of players being ordered from the field because they had used foul and abusive language. In one game against Fulham, the Chelsea Mail reported that after a goal scored by Roderick McEachrane was disallowed, the referee "informed a section of the spectators that unless their remarks were less personal they would be removed." The newspapers were concerned about the example being set by the football players. In his book, Iron in the Blood, John Powles, points out that a journalist reported after one London League game: "I am not an anti-tobacconist but I do not think it is at all good form for a goalkeeper to be seen smoking a cigarette in goal whilst the game is in progress , and for a linesman to be seen smoking a pipe. Yet both incidents occurred on Saturday at Ilford." Arnold Hills used to organize a New Year party for the children of his employees. For example, this is how a local paper reported the party that brought in 1898. "Professor Anderson gave a few conjuring tricks and the young people were much amused by the comical actions of some of the Thames Ironworks Minstrels. Mr Hills gave a short address, and after nearly two hours had been spent in an enjoyable manner the children were marched out of the hall, each receiving a bun and an orange." The newspaper also reported that members of the Thames Ironworks football team were in attendance. The Hammers were praised for the football they played that year. After their game against Queens Park Rangers, the local paper reported: "Ironworks are a well balanced side, solid in defence, with a nippy forward line... Hird is an exceptional player both at dribbling and shooting." In the final few weeks of the season it became clear that the title race was between Thames Iron Works and Brentford. The two teams played against each other on 23rd April, 1898. The Irons had not lost a game all season and had a one point advantage over Brentford. A party of 200 supporters left Ironworks Wharf and travelled along the Thames to Kew where they caught a train to Brentford. Watched by over 3,000 people, the game went badly for the Irons. They played most of the game with only 10 men after Arthur Woodcock had to go off with a twisted knee. Henry Hird also had a goal disallowed and the Irons lost to a goal scored by David Lloyd. Brentford now had a one point lead with only one game to go. Brentford played Barking Woodville, who were third from bottom in the league, whereas the Irons had to face the 2nd Grenadier Guards. During the game Charlie Dove was badly injured and could play no further part in the proceedings. However, it did not stop the Irons winning 3-1 with Robert Hounsell (2) and George Gresham getting the goals. Soon after the game news arrived that Brentford had been surprisingly beaten by Barking Woodville. The Irons had won their first league title. Nine of the league winning side played in the majority of games: George Gresham (16), Jimmy Reid (16), Simon Chesham (15), George Neil (14), Henry Hird (12) Walter Tranter (12), Charlie Dove (10), David Furnell (10) and Robert Hounsell (10). Top scorers were Gresham (12), Reid (10) and Hounsell (8). During the season several Hammers received representative honours. David Furnell played in goal for Essex in a game against Middlesex. The former Iron, William Barnes, scored one of Essex's goals. George Neil and Walter Tranter, the club's full-backs, represented the London League against the London F.A.